Pope Francis named his first group of new cardinals, often called “princes of the church,” last week. The 19 men will be formally appointed next month. Media reports have observed that Francis, the first pope from outside Europe in modern times, chose several cardinals from the developing world. Francis’ immediate predecessor, Pope Benedict XVI, selected 90 cardinals over five consistories during his nearly eight-year papacy. More than half of those (52) were from Europe, and the conclave that elected Francis was heavily European. By contrast, just eight of Francis’ 19 picks are from Europe and six are from the Latin America-Caribbean region, which is home to 39% of the world’s Catholics. 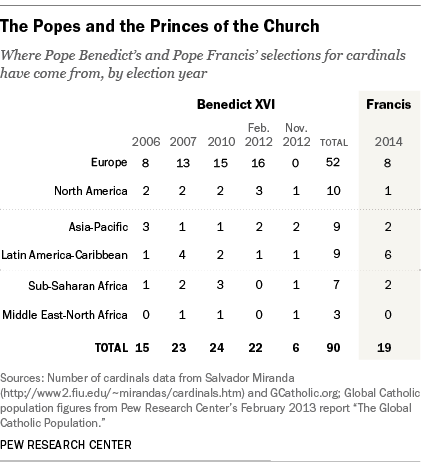 Nine of Benedict’s 90 cardinals (10%) were from Latin America and the Caribbean. The job of each cardinal is two-fold – to advise the pope and elect his successor. In 1973, Pope Paul VI set a ceiling on the number of cardinals who could elect the pope at 120. After the age of 80, cardinals can no longer vote in the gathering of papal electors, called a conclave. The elevation of a group of bishops to the office of cardinal takes place at a formal meeting called a consistory. Most cardinals either lead dioceses, or Vatican departments. In the middle ages, when the church was democratic, priests elected bishops, who elected the pope. Cardinals were simply the priests leading the most important parishes in Rome. 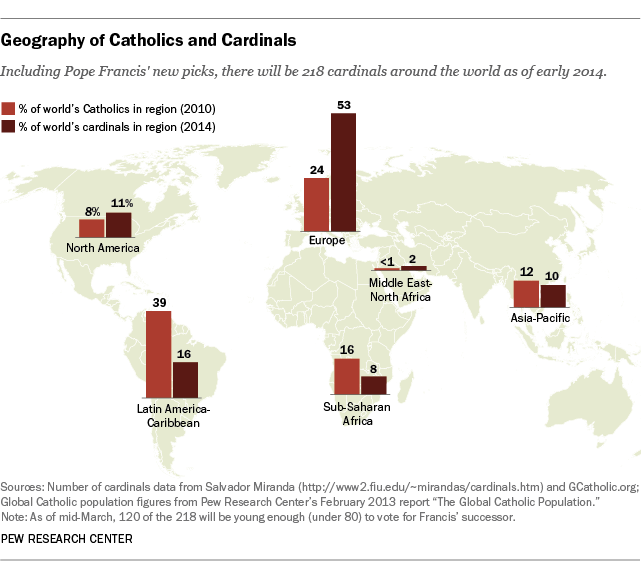 Through the centuries, church leaders decided cardinals should represent the growing church around the world.